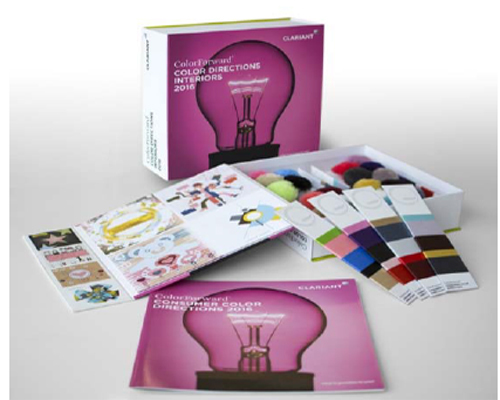 Muttenz, February 19, 2015 – Clariant, a world leader in specialty chemicals, has released ColorForward® Interiors 2016, the third annual trend and color forecasting guide for the fiber and textile market. This year’s edition was expanded to reach a wider range of textile yarn and filament producers, including those serving the carpeting, upholstery, automotive, and interior decoration sectors. This unique creative tool from Clariant ColorWorks® defines four trends that can be expected to attract consumer attention in the next few years and creates a color palette that can help marketers tap into the emotions behind those cultural currents. For the first time, the ColorForward Interiors portfolio includes not only pompons made of polypropylene (PP) and polyamide (PA) fibers, but also “wrap cards” with polyester fiber samples.The polyester fibers are produced as air-textured yarn (ATY), which is also commonly known by the old DuPont trademark, Taslan. ATY yarn is commonly used in the automotive industry and also in furniture upholstery and clothing. The pompons are made from bulk continuous filaments (BCF) to create a texture that is favored for carpeting made in Europe, the Middle East and North America. All fibers in ColorForward Interiors 2016 are dope dyed or spin dyed using Clariant masterbatches(color concentrates) to impart color to the yarn. Liquid Minds… this theme springs from the idea that people have reached a point where slow evolutionary change has to give way to revolutionary innovation; where they walk away from the comforting embrace of nostalgia, trust their instincts, look at the world through new eyes, and take bold risks that open up new insights and great leaps of innovation. Oh, my go(l)d… an unapologetic acknowledgement that excess can lead to unique pleasures, whether one is a super-rich celebrity or a fan who follows them through social media, “people” magazines and reality TV. Like it or not, outlandish, gaudy baubles and outrageous behavior is “in”. These colors are classy and brash, all at the same time. Don’t Touch My Jelly Shot! is a lime green,and gold, naturally, is called You Cannot Afford Me. Love… is spelled with a Wi-Fi symbol inside the ‘o’ to represent the ways in which technology and human life have merged. Immersed in the cloud, wirelessly connected sensors track personal health and even create new connections between people. We access medical information, monitor vital signs and depend on devices to help carry out even the simplest of tasks. Technology has become an invisible, yet caring, family member. The colors in this palette are warm and comforting, ranging from the soft, brown Teddycare, to a bluish grey silver called Invisible Attraction and a coral pink named Cora(l)zon. Work It Girl… this theme points to a new kind of feminism that ignores stereotypes about what is feminine and what it means to be empowered. It is about having the freedom to be what you want to be. Women today don’t feel the same need to limit themselves the way they used to. The power of the Internet and all those other social connections are giving women a stronger voice and they are using it to create new definitions of what it means to be female. The colors in this grouping range from a flaming red/orange called Kiss My…, the cheekiness of The Bush Is Back, a brand-new multicolor effect that encapsulates tiny fibers of pink and black in a transparent matrix, and also a soft, transparent pink to affirm that you no longer have to be embarrassed to show your femininity. There are five colors representing each trend and they are reproduced in a total of 20 pompons.There are also four wrap cards, with each card holding fibers of all five colors of the four trend groups.